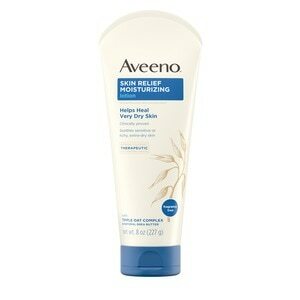 Aveeno Skin Relief Moisturizing Lotion is a rich, yet fast-absorbing therapeutic lotion that helps heal and relieve very dry skin. Gentle enough for sensitive skin, it starts to work immediately to nourish and restore skin's essential moisture, so that skin looks and feels soft and healthier. Specially formulated with soothing Triple Oat Complex and hydrating natural shea butter, this daily moisturizing lotion is clinically shown to help relieve and soothe extra-dry skin and moisturize for a full 24 hours. Our shea moisture lotion is also fragrance-free, steroid-free, and gentle enough for sensitive skin. Aveeno uses the goodness of nature and the power of science to keep your skin looking healthy and feeling balanced. Experience all-day moisture and help heal very dry skin with this unscented lotion, from the dermatologist-recommended skincare brand for over 65 years.